Relieve from work: After the stressful, Monday to Friday walk and work, A lot of people have worked so hard and can’t just wait to get a relieve from work during the weekends. 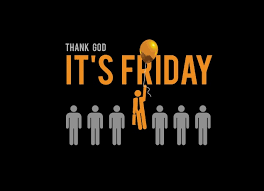 Weekends are like Fuel, they make us start over again and thank God its Friday because one of the most important things Friday does is that it ushers in the weekend. Owambe: Party! Party! Party!..OMG Parties are lovely, they could make a tired person strong, a sad person happy and even make single person married…if you know what i mean, almost everyone love parties and most specially if you happen to come from the western side of Nigeria, we do not joke with it. The wedding cakes,the music, the clothes(Aso-Ebi), the pictures, the drinks, small chops and party jollof rice..OMG…PARTY JOLLOF RICE…It tastes so good, dont have an idea if its the pot or the gas or the wood or the people cooking it that makes it special. Owambe starts on Friday and sometimes go all through to Sunday. The Clubing: For the club riders, its a time to make new friends, hang out with old paddies, office weekend treats and so on. So thank God its friday(TGIF), but beyond this, i think weekends gives you a chance to have some free and spare time. While you are at resting and having fun, also take some time out to develop and improve yourself. Start building and working on that little idea. Remember little drops of water makes a mighty ocean. Thanks for stopping by, Kindly subscribe and comment. Former Governor’s son, Debola Daniels gets engaged!